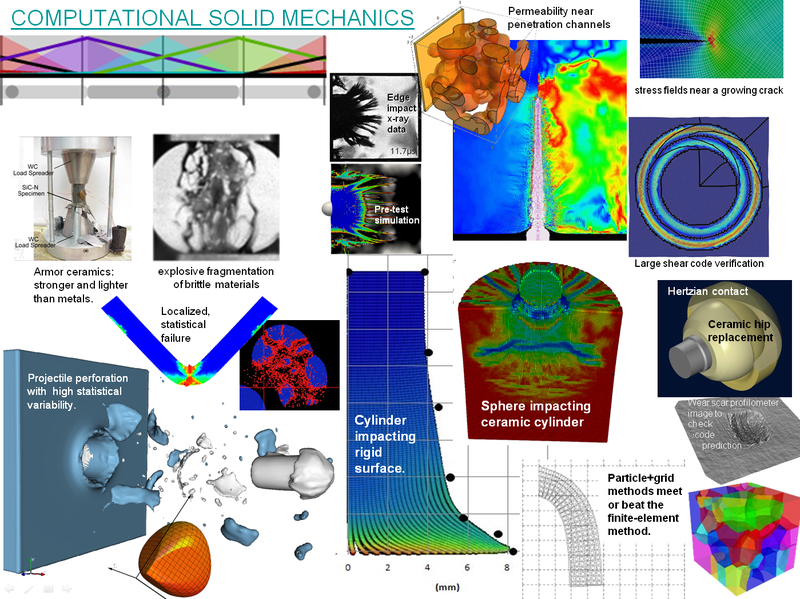 Established 2007, the Computational Solid Mechanics (CSM) group conducts research and development of numerical methods for predicting response of solids to severe loading conditions. Led by Rebecca Brannon, PhD, the group employs the work of both postdocs and students in doing research in areas such as: shock physics, composites, thermomechanics, electromechanics, and biomechanics. The CSM lab has benefited from close collaboration with Dr. Jim Guilkey, who is one of the original developers of the University of Utah’s UINTAH computational framework. The CSM group has now augmented UINTAH with the Kayenta Geomechanics model, originally developed by Dr. Arlo Fossum and Dr. Brannon, with significant contributions from Dr. Erik Strack of Sandia Labs. 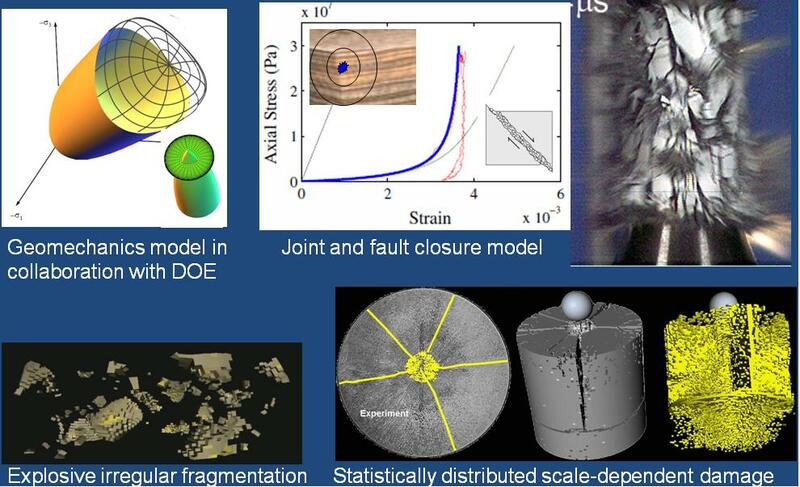 Massive deformation of complex geometries at multiple scales and rates (examples of UINTAH). Simulation credit to Jim Guilkey and Brian Leavy. 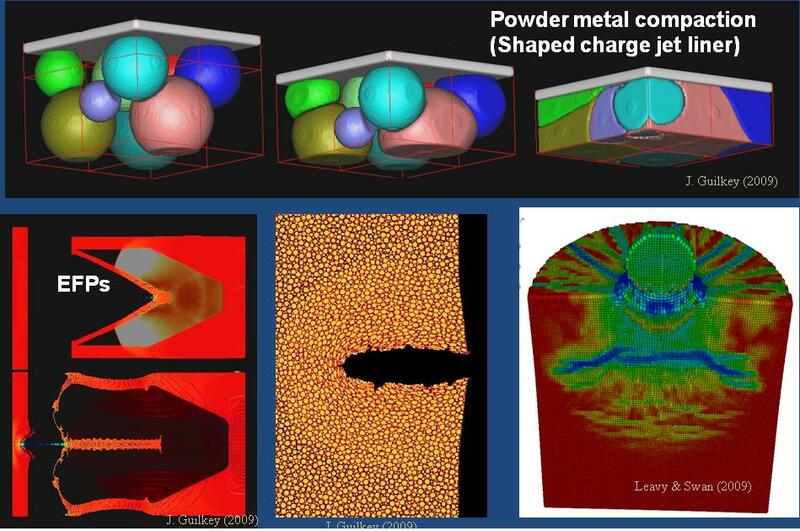 As mentioned above, the CSM group also maintains and enhances the Kayenta geomechanics model, which has been used extensively in the DOE complex, with armor applications in the DOD, and has been installed into the University of Utah’s UINTAH code. The Kayenta model includes scale-dependent statistical damage, which has helped it to outperform many legacy models in its predictiveness of impact and penetration-induced damage without parameter tuning. Applications to date have included predicting damage in shaped charge jet completion of well bores, accelerated wear in ceramic hip implants, kinematics of massive deformations of nonlinear materials, novel composites for protective structures such as bumpers and debris shielding, advanced numerical verification using method of manufactured solutions, deformation induced anisotropy and its thermodynamically consistent coupling to apparent strength and damage properties, nonlocal and statistical failure theories in particle codes such as the Material Point Method. This work has involved collaborations with Sandia National Laboratories, Idaho National Laboratory, University of Washington, the Army Research Laboratory, University of Queensland (Australia), and various industrial partners.